Savanah Frisk (Kapaa High School), Danielle Keahi (Kamehameha School), and Noelani Murray (Kauai High/Intermediate School) enjoy a break during Hawaii Delegation rehearsals at the Intel International Science and Engineering Fair. Nine Hawaii students earned recognition, over $7,500 in cash awards, and even an overseas travel opportunity this week at the Intel International Science & Engineering Fair (Intel ISEF), the world’s largest international student science competition. The premier pre-college science event culminated today at the David L. Lawrence Convention Center in Pittsburgh. In all, two dozen high school students from Hawaii public, private, and home schools represented the Aloha State. At today’s Grand Awards ceremony, three Hawaii students were recognized for their work in life sciences. Danielle Lyn Keahi, 18, of Kamehameha Schools at Kapalama on ‘Oahu, tooksecond place overall in Medicine and Health. She received $1,500 for her work on mutated cells in mice. In Biochemistry, two students placed fourth overall: Alec Kaipo Takeshi Matsumoto, 17, also a Kapalama student, and Shalila Shek de Bourmont, 17, of Hilo High School on the Big Island. Both received $500 for their presentations on muscle tissue and endemic Hawaiian plants, respectively. 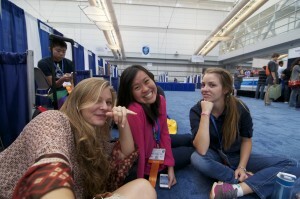 Hawaii students also won accolades in Intel ISEF agency awards. Savanah Quinn Frisk, 16, from Kapa‘a High School on Kaua‘i, won a first place award for her study, “Who Do You Listen To? An Exploration on the Effects of Age and Gender on Listening Comprehension.” Her cash award of $1,750 from the Acoustical Society of America is to be shared with her school and teacher. And Viola Mocz, 16, from Mililani High School won an all-expense trip to the CERN facility in France and Switzerland. Her project, “New Ideas in Physics: The Mass Ratio of Elementary Particles from Torus Geometry,” earned her the trip courtesy the European Organization for Nuclear Research. She also won honorable mention from the American Association of Physics Teachers and the American Physical Society. Mocz’s science savvy continues a strong family legacy of excellence. She is the youngest of three siblings, all of whom have now won awards at both the Hawaii State Science and Engineering Fair (HSSEF) and the International Science and Engineering Fair over the past decade. Her older siblings, Philip and Lucia currently attend Harvard University. Finally, at today’s Grand Awards ceremony, three more Hawaii students were recognized for their work in the Life Sciences category. They include Danielle Lyn Keahi, 18, and Alec Kaipo Takeshi Matsumoto, 17, from the Kamehameha Schools campus in Kapalama on O‘ahu, taking second and fourth place and winning $1,500 and $500 respectively. Hilo High School senior Shalila Shek de Bourmont also earned a fourth place berth and $500. These awards culminate a week of intense competition that began on May 13. Hawaii’s delegation competed among over 1,500 students representing over 70 countries from around the world for $13 million in awards and scholarships. They earned the trip after taking top honors at district fairs and at the 55th Annual HSSEF, held last month at the Hawaii Convention Center. The Hawaii Academy of Science (HAS) is a private, non-profit organization founded in 1925. The mission of the HAS is to promote scientific research and education in Hawaii and the Pacific Region. For more information, visit hawaiiacademyofscience.org.